Panadol ActiFast tablets have been specially formulated so that the paracetamol is absorbed up to twice as fast as standard paracetamol tablets. When you have a headache, Panadol ActiFast can relieve pain fast. 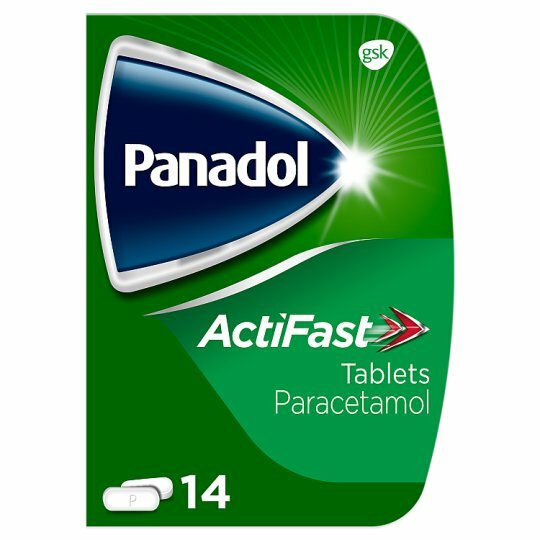 Containing paracetamol, Panadol ActiFast can relieve common types of pain, including backache, sore throats, joint pain, muscle pain and toothache. Panadol ActiFast can also help to reduce fever. When experiencing pain, adults and children aged 16 years and over should take 2 tablets with half a tumbler of water (100ml) every 4 hours as needed. Do not take more frequently than every 4 hours or more than 8 tablets in 24 hours. Swallow 2 tablets with half a glass of water (100 ml), every 4 hours as needed.